Many of the biggest online bookmakers offer betting via mobile phone. The ease of access and flexibility of mobile betting allows bettors to place wagers on sporting events, horses, and financials quickly and easily. If your phone has an internet browser, then you're set to go. Betfair is known for leading the industry with innovative concepts and for helping to popularize person-to-person exchange betting. All of the website's key features may be found on your mobile, including: in-play betting, a full range of markets, current and future odds pricing, horse racing, and more. One-click betting makes for swift and intuitive site navigation, and sharp, full-color graphics give the mobile site a sleek feel. 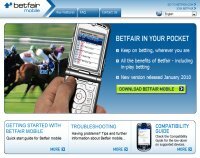 To get started with Betfair Mobile, first sign up for a wagering account, then follow the steps on the website's mobile betting page. Sportingbet has come to be known as an established brand in online betting, with a sizable variety of wagering options. Mobilebet by Sportingbet offers the same features as the online brand, with extensive sports coverage and up-to-the-minute prices. Available 24 hours a day, you will never miss a punt thanks to MobileBet's free, safe and secure service. To wager with MobileBet, start by setting up an account with Sportingbet. Once you are a registered customer, proceed to the MobileBet main page where you'll find some easy-to-follow steps on getting started. One of the most reputable brands in the business, William Hill has offered mobile betting on sports for several years. William Hill Mobile offers 24/7 convenience to a wide range of markets, including Football, Horses, and Greyhounds. Highlights include betting on live in-running contests and accessing live results from Horses and Greyhounds directly on your mobile. Their handy SMS service also provides prices, scores and results for many other contests. To begin betting with the William Hill Mobile sportsbook, begin by opening a regular account. After you've joined, visit the mobile betting page which outlines one or two basic steps for startup.